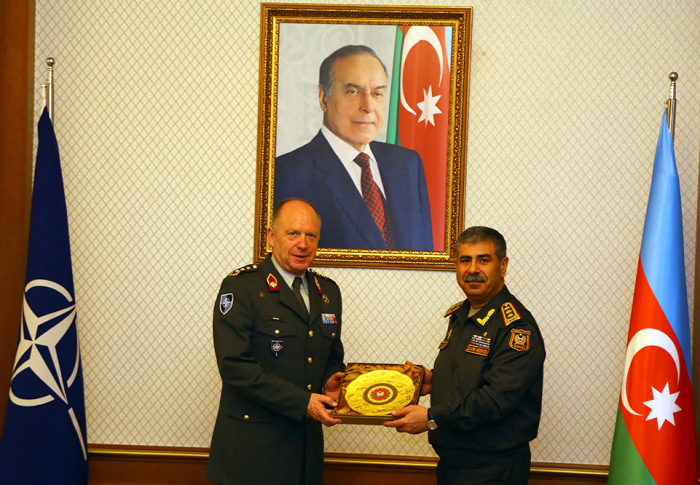 Azerbaijani Defense Minister Colonel General Zakir Hasanov on Wednesday met with a delegation led by Lieutenant General Jan Broeks, Director General of NATO’s International Military Staff who is on a visit to Baku. Stressing that the visit coincides with the 70th anniversary of NATO and the 25th anniversary of Azerbaijan-NATO cooperation, Minister Hasanov noted that Azerbaijan’s relations with the Alliance are multilateral and special attention is paid to this anniversary of the partnership at the state level, the Defense Ministry reported. The defense minister recalling the political support provided by NATO to the territorial integrity and sovereignty of our state, brought to the attention that this serves to strengthen Euro-Atlantic security and is also important for regional peace and stability.